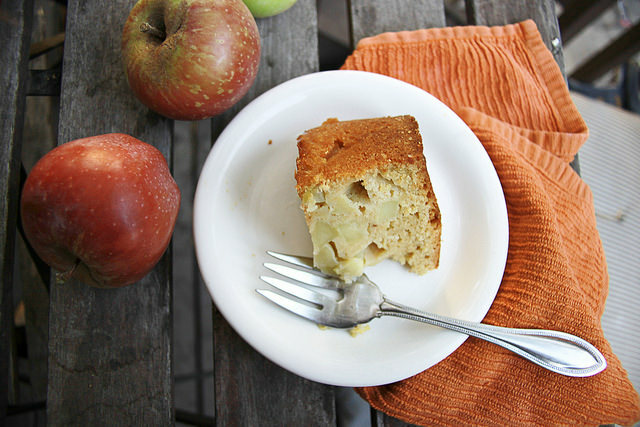 We went apple picking this weekend, which means I have about 20 pounds of apples in my kitchen, which means this easy apple cake recipe is going to be made again soon. Apple picking is one of those things I used to miss most about living in the northeast. From the first autumn Ken and I were dating (16 years ago now!) we used to climb into a car (first a tiny blue Ford Festiva, later a zipcar), drive out into the country, and see some beautiful color and pick apples. 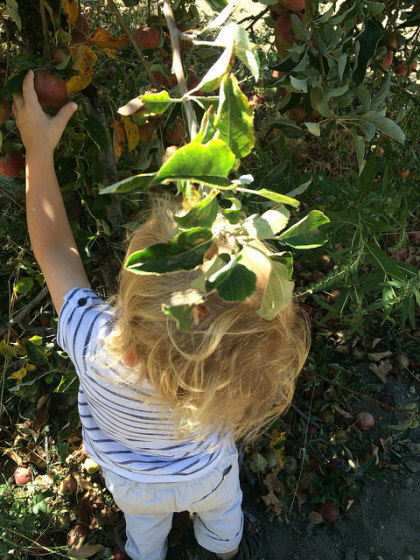 When we moved to Southern California, we thought our New England apple-picking days were done. But, as I described three years ago, we were mistaken. It took us three years to go back (a delay I attribute squarely to a curly-headed imp we call Typhoon Bootsy) but we’re glad we did. As we were driving through the Inland Empire (such a glamorous name for a less than glamorous place), listening to the incessant chatter and music of our delightful children (Bootsy is perfecting his Ozzy Osborne version of Kumbaya), we realized that the apple orchards are just as close to us in Los Angeles as they once were in New York. We pulled up to Stone Pantry Orchards (trees laden with apples! Close enough to the ground that even the littlest one could pick!) and proceeded to fill a bag. Then we filled another bag. 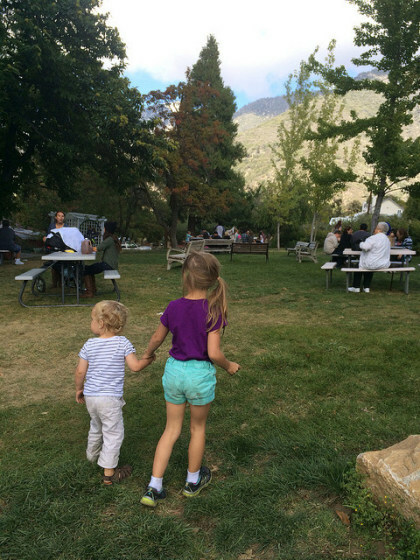 By the time we had eaten, waited in line for donuts, waited in line for the bathroom, bought a couple of gallons of apple cider and assorted balloon-powered vehicles (a big hit with the 2-year-old), we were tuckered out, and drove home to the blissfully silent sound of two kids, napping in the back seat. Until I got home and was faced with 20 pounds of apples, some with worms, (children are not the most discriminating pickers) sitting on my kitchen table. On a Sunday night, after my grand outing, and exhausted by a weekend with my children, I was not up for pie – too much rolling. And I wasn’t about to start applesauce or apple butter at 6 pm on a Sunday. The solution presented itself: an easy-peasy apple cake, which took about 5 minutes to put together and could use the good parts of the wormy apples. Some apple cakes are not really worthy of the name, but this is a good one – really just chunks of apples held together with a smattering of batter, made rich with brown butter and zippy with bourbon (though if you want a little less zip, apple cider and vanilla would make a fine substitution). 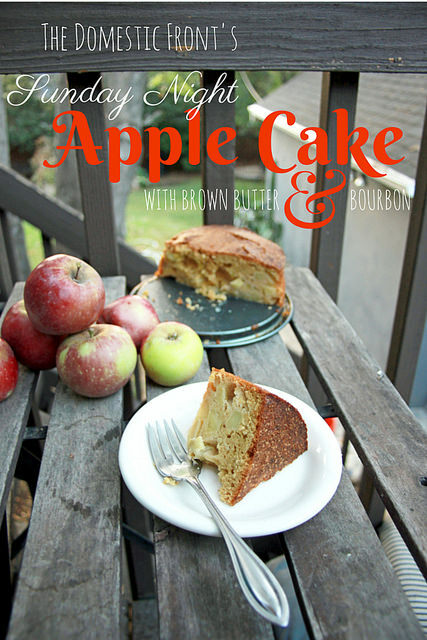 True, it only made a dent in my 20 lbs of apples (but it’s so fun PICKING them) but this is a cake you can eat for breakfast, lunch, tea and dessert, and I’m sure it will be in the rotation again before my apples turn to mush. Butter and flour a 7" round springform pan (an 8" could be used as well, but start checking the cake for doneness about 10-15 minutes early). Toss the apple chunks with lemon juice and granulated sugar. Place into the pan. In a small saucepan, melt the butter and heat over medium heat until nut brown and fragrant. Combine the browned butter with the sugar, add the eggs and bourbon and stir until incorporated. Combine the flour with the baking powder and salt,and stir that mixture into the eggs, butter and sugar mixture. Pour the batter over the apples in the pan. Bake 30-40 minutes, or until a skewer inserted into the middle of the cake comes out clean. Repeat as necessary until your apples are all gone. This recipe was adapted a bit from Around my French Table by Dorie Greenspan and a bit from Classic Home Desserts by Richard Sax and a bit from my own brain and pantry.